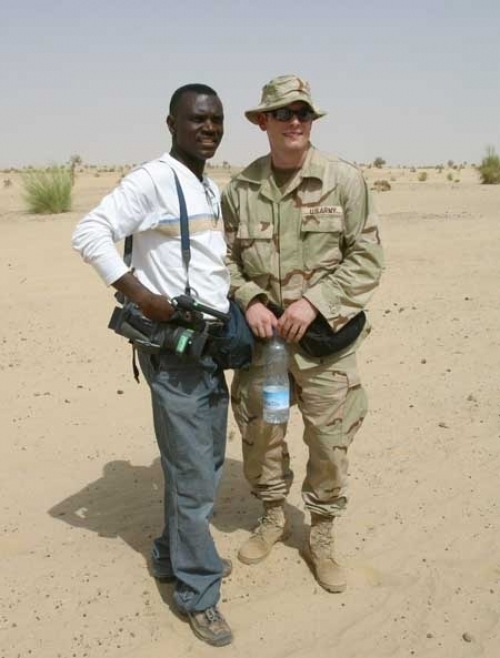 Romuald Luyindula, APTN's Producer/Cameraman in Abidjan, is photographed with a US soldier in the desert of Timbuktu, Mali. He was there in March 2004 to cover the training of Malian soldiers by the US military as part of the war on terrorism. 23.06.2006 Romuald Luyindula, APTN's Producer/Cameraman in Abidjan, is photographed with a US soldier in the desert of Timbuktu, Mali. He was there in March 2004 to cover the training of Malian soldiers by the US military as part of the war on terrorism.